Addington Palace, billed as Surrey’s most lavish venue with an astonishing history, is a stunning Grade II* listed Palladian Style Mansion, which is perfect for any event with large numbers. The hotel lies within 163 acres of the beautiful Surrey countryside and it’s history dates back to King Henry VIII and was once home to six of the Archbishops of Canterbury. This venue is now as an exclusive hire venue for weddings, including Asian weddings, corporate and private events. 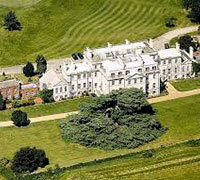 Within the Palace grounds, there is also luxury wedding accommodation available.